Herbarium is a very popular ornament with dried plants in a fashionable bottle. We are having the handmade Harbarium class on Sun 18 November. Everyone who likes flowers, who’s interested in the flower designing are welcome! If you would like to participate, please contact to the office staff. 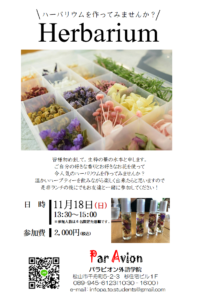 前 過去の投稿: Flower Arrangement for Christmas! !